Tradition means a lot to me. I come from a large Italian-American family and my generation of that family has always been proud to learn about and continue the holiday traditions passed on to us by our grandparents, parents, aunts and uncles. We haphazardly formed a chorus of cousins and sang Christmas carols after dinner on many Thanksgiving nights. We joyfully sat down to a meal of seven fishes every December 24th. We played with the big spinning tops Aunt Ida placed under her Christmas tree every holiday season. There were ancient ornaments and decorations displayed each year and then carefully passed on so they could be enjoyed and appreciated by future generations. There were foods and desserts that simply had to grace the table, to make any special occasion complete. We were taught, my siblings, cousins and I, to keep certain routines in our hearts, because, as we now know, pulling them out every year inspires memories, stories we share with the new generation we have brought forth. Tradition brings back to life the family members who have gone before us. We honor them by remembering them, by continuing their ways, by invoking them at our celebrations and thrilling our children with tales of their exploits, their heroics, their laughter and love. They were the Greatest Generation. Born in the teens, 20s and 30s of the 20th century, they endured the Great Depression with dignity and faith. They fought and won World War II with a sense of purpose and determination no subsequent generation would ever dare to claim. They did whatever they thought they needed to do to make life better for their children and grandchildren, without complaining. And then they encouraged us to start traditions of our own. So we did. We, two of us, would walk on the beach and sing California Dreaming every year on vacation in Florida. When we were able, we’d play a wild game of charades after dinner on Christmas Eve, a tradition we will try to revive this year when some out-of-town cousins will be near to us, once more. Three of the cousins found the seven fishes for Christmas Eve tradition a bit too daunting and changed it to a simple meal of linguine with clam sauce. Some cousins still go every year to midnight mass. And we invented the Christmas Bowl. Four of us. Crazy cousins. We would eat our amazing Christmas dinner; antipasto, lasagne, meatballs and sausages, wine, braciole, stuffed artichokes, glazed ham and mushrooms, pies and cookies, struffoli and chestnuts, fennel. Uncle Frankie had served as a cook in the Navy. Aunt Ida had learned secrets from our grandma. Their Brooklyn home was filled every Christmas with relatives, music and food and candy canes and silver lanes aglow. We’d eat and laugh and celebrate the day and then clear the table, digest and rest. And then my sister, two cousins and I would head outside. The weather never mattered. One year it was 45 degrees and foggy. One year the temperature was a frigid 7, with a wind chill that made it feel much worse. Some years, East 8th Street was covered in ice. Some years, it was downright balmy. We didn’t care. We dressed accordingly. And we made up the rules as we went along. There had to be a new football every year. The first year, it was an old tennis ball. Another year, it was a yellow Nerf ball. We were all on the same team, so we had no real opponent. We pretended we were the lowliest team in the NFL at the time. I can remember being the New Orleans Saints or the Tampa Bay Buccaneers quite often. We “played against” the winner of the previous year’s Super Bowl, which meant Pittsburgh, Oakland, Dallas, San Francisco or Washington, since this happened in the late 70s and early 80s. We could never run with the ball, we could only pass. We gave ourselves four downs to make it from one manhole cover to the next, a distance of about 100 feet. If we didn’t score a touchdown, our opponent scored. Each possession was a quarter of the game. After two quarters, we’d march back down the street humming a John Philip Sousa tune, to mark halftime. My cousin John was almost always the quarterback. My sister Gloria, cousin Judy and I were the receivers. One year the fog made it almost impossible to see the ball. We actually “lost” that year and when we went inside, our family members, some of whom had watched, squinting, from the living room window, wondered how we could have lost when there was no opposing team. The best game happened in the bitter cold, on a Christmas night when the nearest streetlight was out. Our “field” was very dark. We joked about how, if one fan in the stands stood up to cheer us on, they all had to stand up because they were all stuck together, like icicles, that’s how cold it was. At the end of four quarters, the game was tied, 14-14. We were using a small brown dog-toy football that year which, given the lack of light, was incredibly hard to see, so we had only managed to score two touchdowns. We decided, despite the cold, to play overtime, since no one was satisfied with a tie as the final score. We started at the north manhole, as usual, the one closer to Foster Avenue. Someone caught the first pass for a gain of about 20 feet. The next pass was dropped, either because of stiff, frozen fingers or impossible darkness. The next pass gained us another 25 feet or so. That left us with one more chance, one more pass to win the game. But the end zone was at least 18 yards away, at the darkest end of the street. John told us all to just bolt for the far manhole and turn around. I ran the fastest, buzzed up the left side and crossed to the right once I was in what we considered to be the end zone. I saw John launch the little brown ball. It disappeared into the blackness for a second but I could tell it was headed my way. I turned a pinch to my left to try to see it and suddenly, there it was, headed directly for my right ear. I caught it, basically, with my head and then quickly covered it up with my hand so it wouldn’t bounce away. It was the luckiest, craziest, most amazing football catch I had ever made and it saved us the embarrassment of having to tell our warm, relaxing family members that we had lost the Christmas Bowl once again. A true Christmas miracle. The final score was 21-14 (OT) in our favor and I don’t think a more fun football game has ever been played. 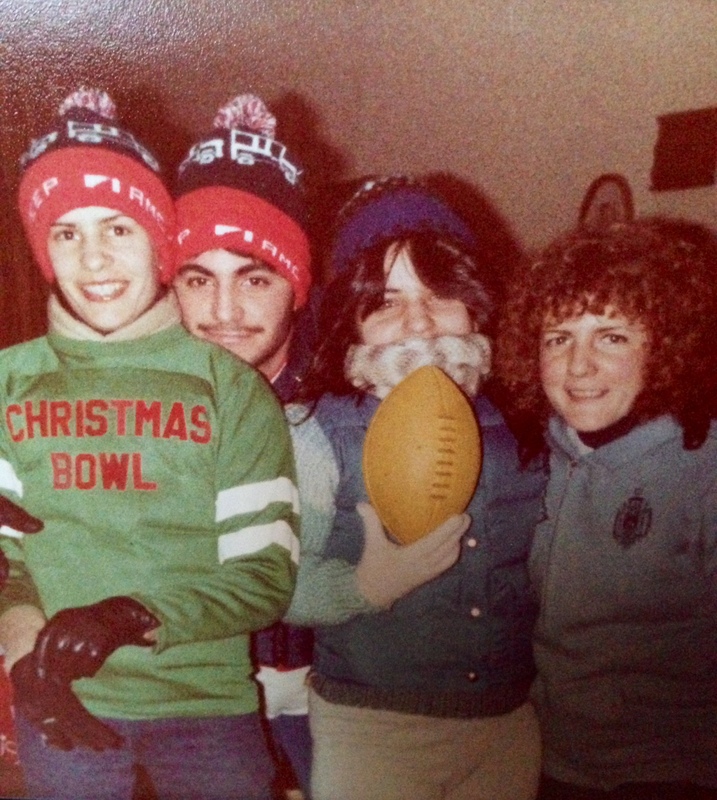 We keep threatening, the four of us, to get together some Christmas night and go back to East 8th Street in Midwood to play the Christmas Bowl one more time, even though a new family occupies that house we used to visit with such joy and anticipation. The front door is the same, the nine living room windows are the same, the stoop is still separated into two sections. Maybe we really will do it someday. For now, we revel in the memories and photos and we share embellished, exaggerated tales of the glory with the newest members of the clan.